Steel or ceramic magnets that have been stored incorrectly, dropped repeatedly or are simply old may lose their magnetic properties. For optimal results when it comes to rejuvenating these magnets, touch one pole to the opposite pole of a neodymium magnet. You can renew a weakened magnet by carefully bringing it into contact with a neodymium magnet. Obtain a neodymium magnet, which is made of neodymium, iron and boron. You can purchase them through online retailers, or at a science supply store. 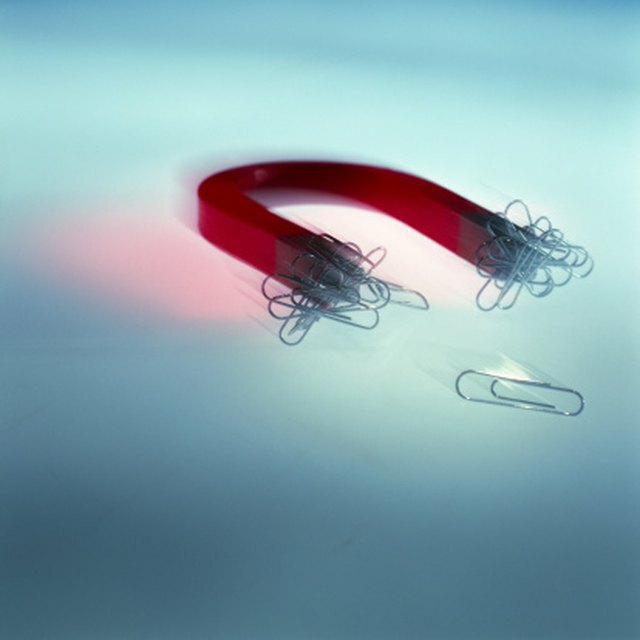 Choose a magnet whose shape will clearly indicate its magnetic polarity, north and south. Bar magnets are good examples; with a spherical magnet, it's harder to tell which "end" is north or south. Also, avoid the strongest neodymium magnets; though they have important uses in science and industry, their powerful magnetic fields can make them dangerous to handle, especially in the presence of iron or steel objects. If it poles are not already marked, identify the neodymium magnet's north and south poles by placing a compass close to the magnet in question. The needle of the compass will point directly south when brought in close contact with the north pole of the neodymium magnet. Similarly, the needle of the compass with point directly north when brought in close contact with the south pole of the magnet. Use a felt-tipped marker to label the north and south poles of the neodymium magnet for future use. In cases where the magnet comes from the manufacturer already marked with north and south poles, this step will not be necessary. Determine the north and south poles of the old magnet that requires remagnetization. To do this, use the compass method described above. As with neodymium magnets, the poles of some steel or ceramic magnets may already be labeled when they come from the manufacturer, thus eliminating the need for this step. Touch the north pole of the old magnet to the south pole of the neodymium magnet. Repeat the process, this time touching the south pole of the old magnet to the north pole of the neodymium magnet. You may want to repeat this step several times in cases where the old magnet is especially demagnetized. Once you've remagnetized your magnets, store them such that their poles alternate, i.e. the north pole of one magnet against the south pole of the next. The magnets will naturally attract each other in this orientation, and storing them in this manner helps preserve their magnetic strength. By contrast, storing them in a random jumble or with like poles against each other (north facing north), magnets will deteriorate relatively quickly. Vera, Kathryn. "How to Remagnetize Magnets." Sciencing, https://sciencing.com/remagnetize-magnets-6316790.html. 29 May 2018.